Dukkah brings back lots of childhood memories for me, dipping bread in olive oil, then in the Dukkah, and eating it with the grown ups at friendly get-togethers. It is an Egyptian spice mix, which in Egypt it is sold as street food, in paper cones, with warm pita bread for dipping. The word is derived from the Arabic word for ‘to pound’, as the nuts and spices are dry roasted and pounded together, to form a dry mix that is neither a powder or a paste. 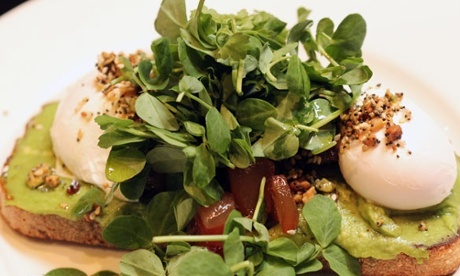 or avocado hummus toast, w/ poached eggs, honey candied bacon and Dukkah. You can also use Dukkah as a crust on meat or fish, such as Dukkah crusted lamb cutlets, or Dukkah crusted fish fillets. The peppercorns give it a nice heat, to go with the warming cumin, and sweet fennel seeds. The dried mint gives it a nice touch to cool it down, all with a delicious crunch and salty finish. Try it first with some good quality, artisan bread, and some tasty olive oil, or for the gluten-free and paleo peeps, sprinkle over your eggs or meat, for a delicious seasoning with a difference. 1. In a small pan, place the nuts, and carefully dry roast them on a medium heat until a nice, light brown in colour. 2. 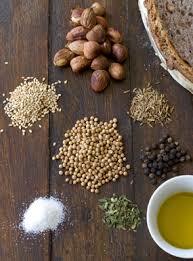 Put the nuts aside, and repeat, one at a time with the seeds and peppercorns until complete. It is important that you do them separately, as each seed cooks differently, so they might burn, when one roasts quicker than the other. 3. 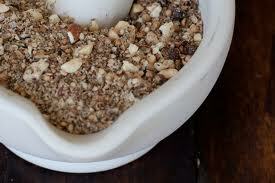 Place nuts, seeds and peppercorns in a pestle and mortar, and pound to resemble coarse breadcrumbs. Add the mint and salt at the end, and give it an extra few pounds to ensure the flavours are well combined. You can use a food processor at this stage, if you don’t have a pestle and mortar, and just pulse until it is the right consistency. 4. Enjoy straight away, and store in an airtight container in a cool dry place.